Do The Andover Test, Dude! 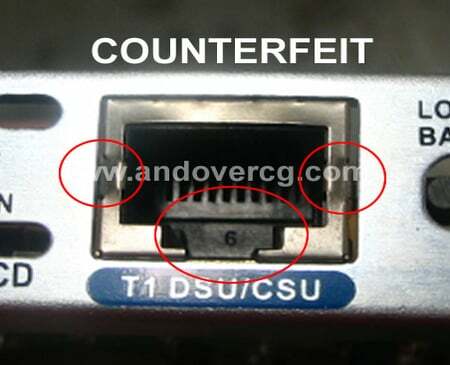 Counterfeit and fake products abound both in and outside of the network world. 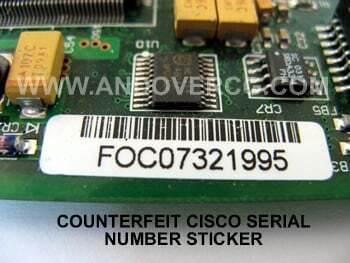 Fake or Counterfeit Cisco WIC-1DSU-T1-V2 cards are everywhere. Take a gander at these on eBay after you do this test. The Andover Test is easy. No power is required. You don't need a console cable and your Cisco qualified tech will not be able to out tech you on this issue. Look at the two Cisco WIC-1DSU-V2 cards below. 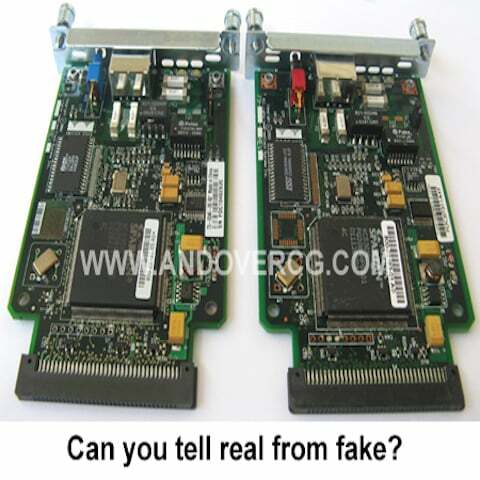 Which of these is a real Cisco WIC and which is fake or counterfeit? Funny thing, when we started this Andover Test, many people proudly described why they did not need to take it. Fear of a bad grade dating back to high school, one would guess. 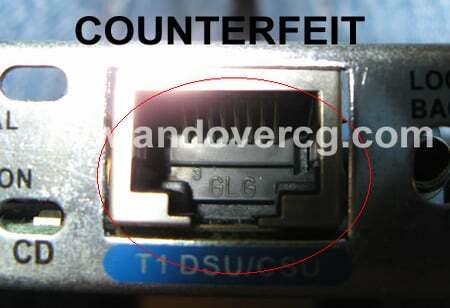 We believe many people do not want to discover they have counterfeit product. 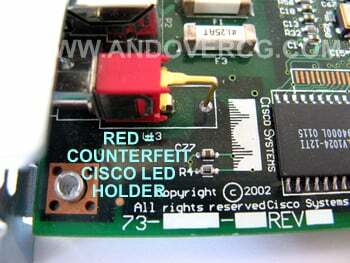 (Would you want to discover, for example, that your coveted Cisco V2 card is counterfeit?) Anyway, here are some standard reasons we've heard from others for not wanting to take the Andover Test. "We do not sell counterfeit period." Our response: If one does not know the speed limit, then one is not speeding. Same idea for counterfeit. "We looked up the serial number at Cisco." Our response: So, where is the receipt? Did the CIA shred it? "We just know our stuff is real because we are experienced." Our response: Great, can you please show us examples of gear that is counterfeit? "We bought these from the Government." Our response: there are over 1,000,000 buyers at all levels of government: local, county, state and federal. Are you telling me all of these buyers are counterfeit-aware? "We bought these from a Cisco VAR." Our response: maybe your VAR is not informed on how to tell them apart. Or worse, maybe they are and do not want to tell you. 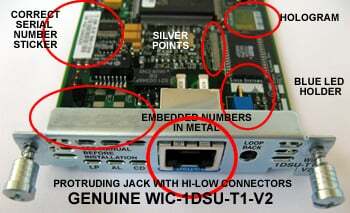 Where are these counterfeit WIC-1DSU-T1-V2s made? 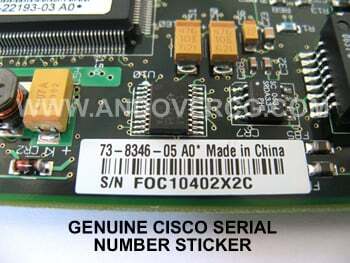 The counterfeits are made in China close to where the real Cisco manufacturering plants are located. Who is bringing the counterfeit cards into the country? Re-sellers who cannot pass up a deal too good to be true and buyers who are not aware of the depth of the counterfeit issue. 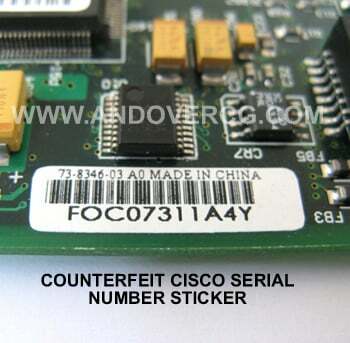 Recognizing counterfeit Cisco WIC-1DSU-T1-V2 cards is relatively easy. Turning them on won't tell you much of anything unless it explodes. This also leads to the first test: if it explodes, then it most likely counterfeit. (If you want the link to the photos of our encounter with the exploding counterfeit, email us. We eventually filed a police report!) Don't expect Cisco to help you with a warranty claim in this situation. But if it doesn't explode and turns on, then you have to look at the card to see the differences. Here are some points to note. We believe none of these are definitive. However, each taken in summary with the other points can lead you to a conclusion on real or counterfeit. 1. STEWART: STEWART in the center of the Jack is required. Many buyers used to insist upon STEWART in the RJ45 jack. 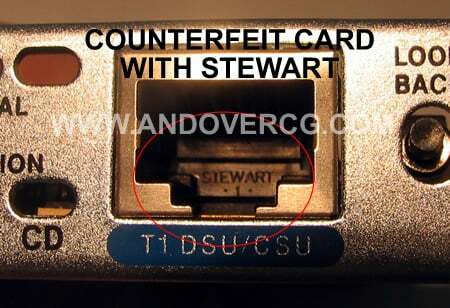 Many counterfeiters got wise and got rid of the GLG jacks and started manufacturing with STEWART jacks. So, while STEWART is required, it is not definititive. 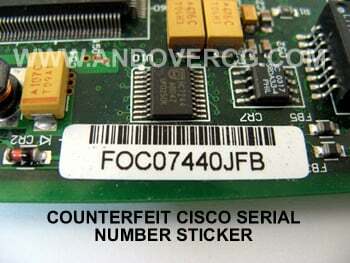 Photograph 1.4 shows a counterfeit Cisco card with STEWART jack. Note: the connectors must also be high on the left and low on the right. 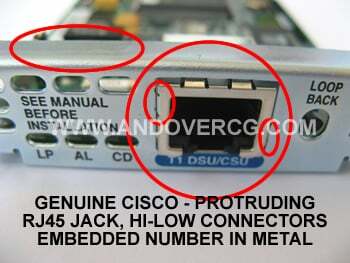 1.2 Counterfeit Cisco RJ45 Jack with "6" and Mid-Mid connectors. 1.3. 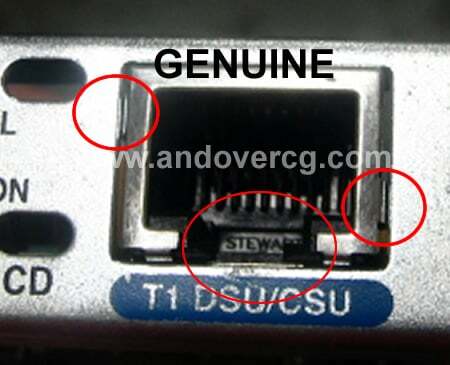 Counterfeit RJ45 Jack with "GLG"
2. 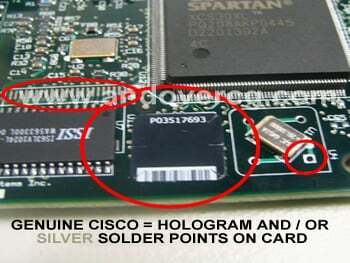 GREEN HOLOGRAM: Newer Genuine Cisco cards have green holograms. Early production models did not. Missing a hologram is not necessarily bad. But it should have a plethora of other good signs such as embedded numbers, blue LED holder, silver points on card, etc. 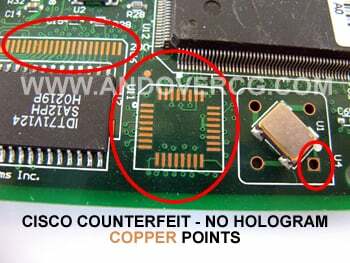 Cards that have no hologram and are devoid of any other positive indicators are counterfeits. 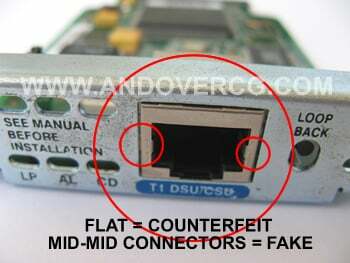 3. RJ 45 JACK: Flat RJ 45 jacks are tell tale signs of counterfeit cards. All genuine Cisco V2 cards should have slightly protruding RJ 45 jacks. 3.1 Protruding, hi-low connectors = Genuine Also shows embedded numbers in metal. 4. HI-LOW CONNECTORS: All Cisco RJ 45 jacks have hi-low connectors. This is the easiest way to visually recognize a counterfeit card. 5. SCREWS: Counterfeit cards we have observed have droopy and shiny screws. The lines are not fine and almost seem sand cast. 6. 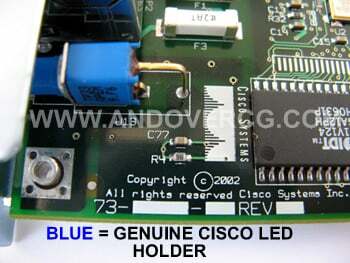 LED HOLDER : Counterfeit cards we have observed have droopy and shiny screws. The lines are not fine and almost seem sand cast. 7. 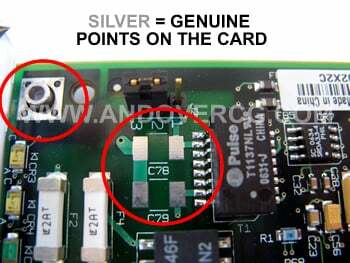 SILVER VS. COPPER POINTS: All Genuine Cisco cards have silver points on the card. 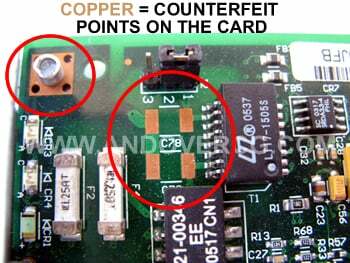 Counterfeit cards have copper points. What we mean by points are all the little soldering points on the card. The less expensive production uses copper. The better quality work - Genuine - uses silver. We are only illustrating a few here. These points are all over the card. 9. EMBEDDED NUMBERS IN THE FRONT METAL PLATE: Counterfeit cards we have observed have droopy and shiny screws. The lines are not fine and almost seem sand cast. 10. QUALITY OF CONSTRUCTION: Counterfeit cards we have observed have droopy and shiny screws. The lines are not fine and almost seem sand cast. 11. 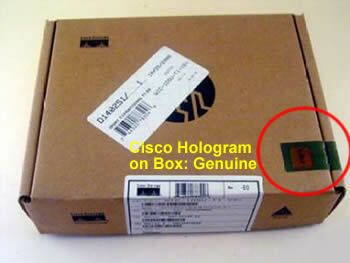 BOX HOLOGRAM: A box with a Cisco Hologram is likely a genuine product. A box without a hologram is suspect. Finally, there is the box. 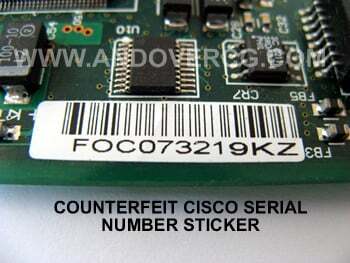 Counterfeit boxes are devoid of Cisco seal tape or a Cisco hologram. It is the most obvious of signals and is definitive for V2s. 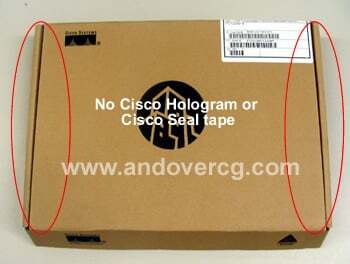 Not only are the cards easily recognizable, but the boxes will lack the Cisco tape and the Cisco hologram that now appear on every Cisco Genuine product.